We're getting so many groups that are having kids help out – that's awesome! It's so great to see children stepping up to do something wonderful for our heroes! It's not often that children make cards appropriate for our heroes to send home. While we may ooh and aah over their art to put on our refrigerators - remember, that's what our heroes would also like to do. Post it on their version of a refrigerator - not necessarily write home on it. 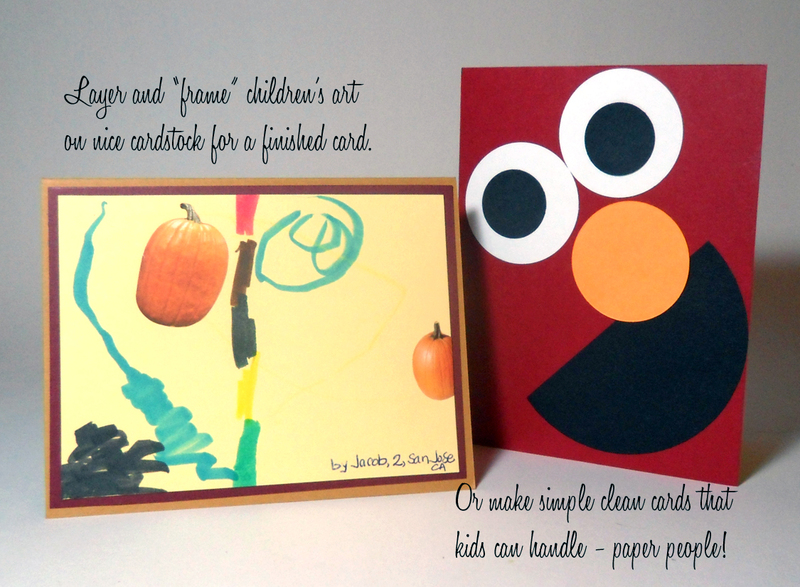 Often our shippers turn kids cards into AnyHero mail, so having the kids write on their own art would be even better! While children have a lot of desire, they often don't have the skills to put together a card that will stay assembled on the long round trip and heavy handling they'll receive. A card made by a child that is crooked, falling apart, made with construction paper, with handwritten strange sentiments can be cute, but is not what our heroes are looking for when they write home to their wives and mothers. Kids art, however, is a beautiful thing to display in their living quarters - that makes a lot of heroes SMILE! Children's craft supplies are fine for AnyHero cards - foamies, stickers, paste and gluesticks, as well as thin papers and construction paper. Those work very poorly for cards that will make the round trip home - so these should be used only on AnyHero cards. And still, no glitter for these cards either. Check out our coloring pages for kids - these are a great way to turn kids loose with crayons, markers, stickers, and their own creativity! If your group of children - a classroom, scout troop, or your family - wants to make cards that our heroes can actually use to write home on, we ask that you carefully guide them by preparing ahead of time for what they'll create. Determine the childrens' abilities before deciding what to make with them - there are ways kids can do this, with your adult assistance! Older children: Some kids of an older age can sometimes assemble a card kit - with the papers going on straight. Have papers pre-cut for them, sample cards to follow, and allow them to color the image. Explain to them that following the pattern is important - turning children loose creatively may be good, but it can often make a good card take a bad turn! Close supervision is often required. Younger children: Smaller kids might not be able to assemble a card from a kit (they often don't 'get' following instructions) but can color the image on an already-assembled card. Youthful coloring - outside the lines, etc - is just fine; have the child sign the back of the card as well, to give it that child-authenticity! Very young children: Most really little ones are GREAT at AnyHero cards; but we've also seen them produce some great little paper punch people! With a design this simple, having smooshes of glue, fingerprints, and poorly punched circles can be part of the charm of the card. Plus, they love Elmo! See sample below. Any age of child: We've received some very sweet cards pairing the drawings of children with the clean presentation of an experienced crafter! 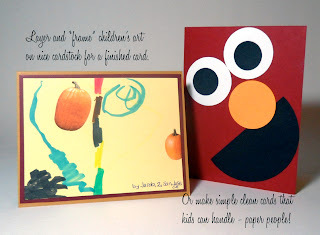 All you have to do is have the child draw or do their sticker-art on a card front, then trim it slightly so the adult can add a cardstock layer to the child's art. These layers "frame" the art and leave it very childlike, while also creating a nice card that a hero might be able to use! See sample below. NOTE: If children's cards are to be used to write home on, they should still use good cardstock, NOT construction paper; no foamies, and no handwritten sentiments (except included in their art for #4). If we want our heroes to select them to write home on, they need to look complete and finished, or they get left behind in the bottom of the box.